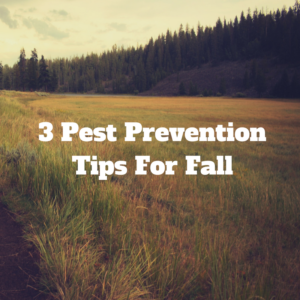 There are 3 pest prevention tips for Fall that are very important to keep your home pest free. Because the weather is getting colder, bugs and critters want to avoid the changing weather too. Most of all, to continue blocking unwanted Fall visitors (aka pests), we have come up with 3 simple and easy tips that will help you. Examine- Take some time to thoroughly examine the outside of your home. This includes all windows, doors, seals, crawl space entries, vents, etc. If there are any broken screens, now is a good time to replace them. Cracks should be sealed with new caulking and door gaps should be closed with quality weather-stripping. It is important to remove old caulking, scraping well to remove any debris while not making any larger spaces. Adding a rubber seal under the garage doors can keep water and pests out. Seal Openings- Any place that you have an opening for utilities can be a super highway for rodents. Mice can squeeze through an opening as small as 1/4 inch. Spiders can get through openings as small as 1/32 inch. Those are tiny spaces. Take a flashlight (even in daytime) to full a full examination. To block those holes or cracks effectively we recommend using wire mesh, expandable foam or concrete. Chimney Cap- Do you have a chimney in your home? They are amazing for beautiful fires during cold weather however they can be an open door for unwanted pests. Birds, bats, raccoons, squirrels and other critters can wreck havoc on your home via the chimney. By installing a chimney cap, you will be stopping their point of entry. Don’t forget any attic vents while you are on the roof. Use wire mesh to block rodents from entering your attic through your vents. If you are experiencing any pest control concerns or issues. Please give our office a call at 615-220-1933 or fill out a contact form HERE.